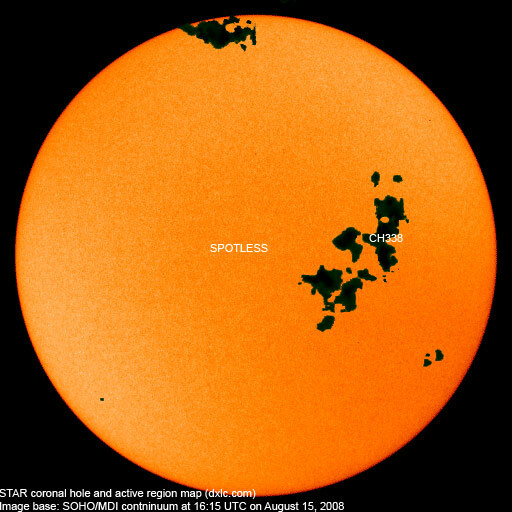 Last major update issued on August 16, 2008 at 05:40 UTC. The geomagnetic field was quiet on August 15. Solar wind speed ranged between 364 and 447 km/s. Solar flux measured at 20h UTC on 2.8 GHz was 65.9. The planetary A index was 4 (STAR Ap - based on the mean of three hour interval ap indices: 3.6). Three hour interval K indices: 22001111 (planetary), 12101201 (Boulder). 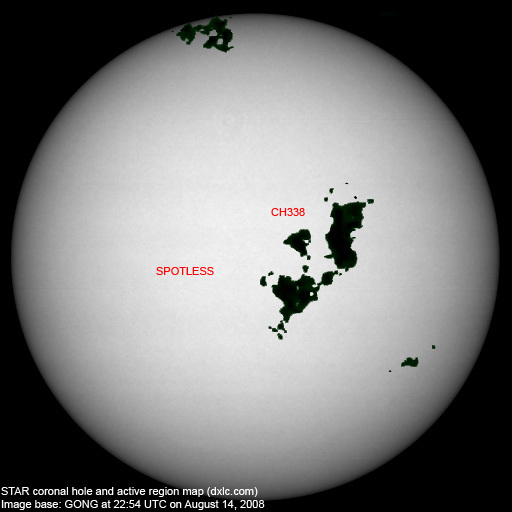 At midnight the visible solar disk was spotless (26 consecutive days). The solar flare activity level was very low. August 13-15: No partially or fully Earth directed CMEs were observed in incomplete LASCO imagery. Long distance low and medium frequency (below 2 MHz) propagation along paths north of due west over high and upper middle latitudes is fair (many stations from the US east coast and the Canadian Atlantic provinces were audible in the morning of August 16, some with good signals. Stations from Cuba and Colombia had good signals as well). Propagation on long distance northeast-southwest paths is poor. 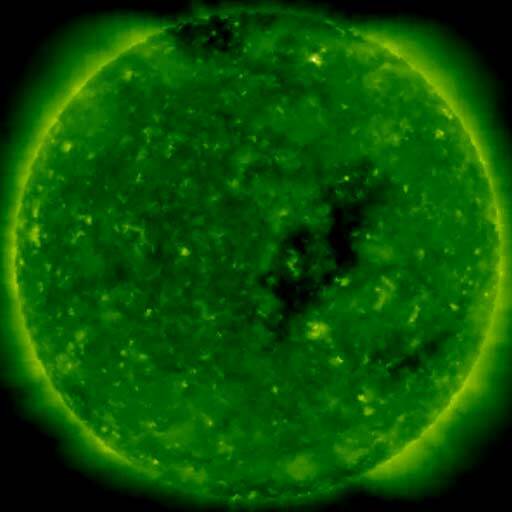 The geomagnetic field is expected to be quiet to active on August 16-17 due to effects from CH338 and quiet to unsettled on August 18.